An almost deserted Inverness Business and Retail Park. Pic by Sandy McCook. He said: “They said they would be removing the safety glass from the highest sections as a precaution. Highland Council is probing how a man was injured by a falling pane of glass at the Inverness Centre on Eastfield Way on Tuesday afternoon. 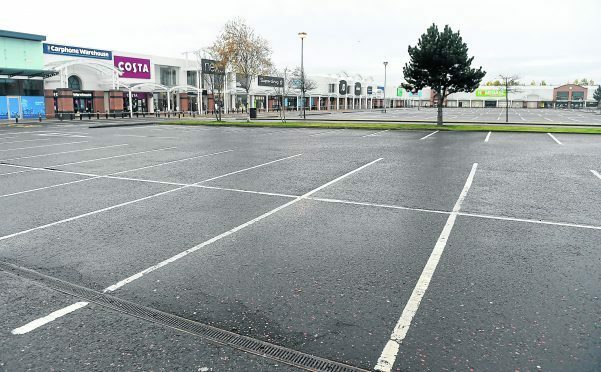 A spokeswoman said: “Highland Council’s Environmental Health Officers have visited Inverness Retail Park today as part of an investigation into the incident. “Their initial focus of the investigation was to ensure that there was no remaining health and safety risk to shop workers and public from the remaining glass panels. Currently, there is no reopening date for the Inverness Centre in sight with some shops displaying “closed until further notice” signs. Yesterday morning scaffolders were called in and it was initially thought they would make at least the entrances safe for shoppers. By the evening that plan appeared to have been abandoned as they had left and no scaffolding had been put in place. Some retailers with premises at the park confirmed that staff would continue to be paid and that some employees had been sent to other outlets nearby. Tesco’s, Burger King, Pizza Hut and the VUE Cinema remain in operation and are located in different sections of the Inverness Centre. The closure of the park comes in response a pane of glass shattering and come crashing down on a man leaving him with injuries to the head outside New Look. It was the second reported incident since Sunday outside New Look, the first happened outside retail hours and no one was harmed.